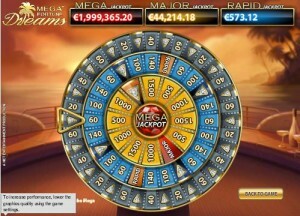 This is the second Mega Fortune slot machine, and it’s designed by the same guys from Net Ent. The Dreams Mega Fortune slot offers you the kind of lifestyle that you dream about when you think about becoming rich. With the action taking place onboard a yacht, with champagne chilled in ice, with fruit cocktails, diamonds and even with diamond encrusted playing cards, it’s a luxurious design which was excellently handled by the developers. 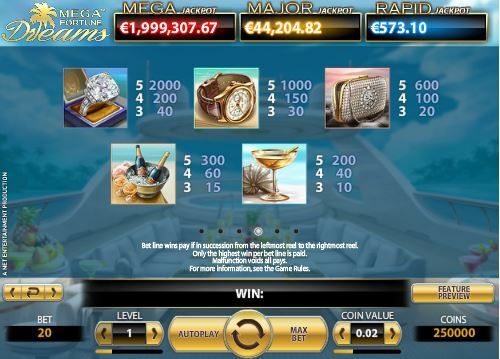 A game which offers some of the best prizes you will find anywhere, Mega Fortune 2 relies on three progressive jackpots to get players to try it out, but it also has a fixed prize of $20,000. 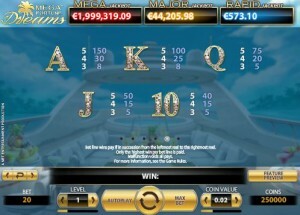 On the 20 lines of Mega Fortune 2 you will discover free games, 10x multipliers, wilds and scatters. 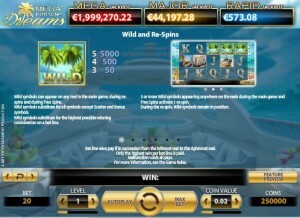 In case the three progressive jackpots aren’t appealing enough, the game also has wild symbols, re-spins, scatters, free spins and multipliers. 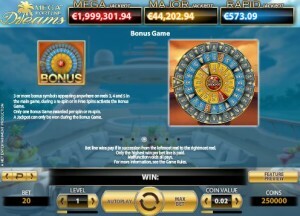 The bonus game is the one that offers the progressive jackpots, with the help of a wheel of fortune. The Tropical Island wild is important to the game, as it is the one that awards the biggest prize of 5,000x when it manages to form up its own combo of up to five symbols. Even on its own it can be useful though, as long as it lands exactly where it’s needed. If that happens, it substitutes for whatever symbol is needed in that location and it contributes to the formation of another combo. Wilds don’t substitute for scatters or bonus symbols. If you happen to get 3+ wilds at the same time, in any position, one re-spin will be offered to you. The wilds that triggered the re-spin stay in place, only the other symbols change. While the scattered Blue Diamond doesn’t give you prizes, it does trigger free spins. Three scattered Blue Diamonds start a feature with 10 free games. Four of them will give you 15 spins for free. 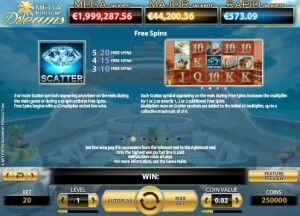 Finally, the presence of five scatters will trigger the maximum of 20 free spins. For each scatter that you get while the free spins are used, you get either 1 to 3 additional free spins, or an increase of the multiplier by 1x or 2x. You start with a 3x multiplier, and it can go as high as 10x. It’s an impressive feature, which just adds to the appeal of an already great game. The bonus game has its own symbol that triggers it. It has a Wheel of Fortune on it and the word Bonus at the bottom. The last three reels of the slot can have these bonus symbols, and you need all three at the same time in order to get a chance at the big prizes. The Wheel of Fortune which loads on the next screen will give you cash prizes and chances to get to the next spoke of the wheel. The Mega Jackpot is in the center of the reel, reachable through the fourth spin. The Major Jackpot is on the third spoke and the Rapid Jackpot is on the second spoke of the wheel. In order to go from one spoke to the next you need to get the diamond arrow, not a regular prize. The slot, while capable of making you a millionaire, will only ask for wagers of up to $80. The bet uses a maximum of 80 coins, each one with a denomination in the $0.01 to $1 range. Each line gets up to $4. The game’s own top prizes will offer you 5,000 times the line bet, so you can expect $20,000 cash. The alternative is one of the three progressive jackpots which are won through the bonus game. You have the Mega Jackpot, which can make you a millionaire. Then, there is Major Jackpot, which gives out prizes in the five figures range. 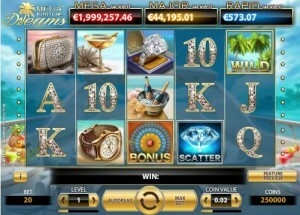 Finally, there is Rapid Jackpot, with payouts worth less than $1,000. It’s one of the most impressive luxury themed slot machines I’ve seen, truly a great piece of design. 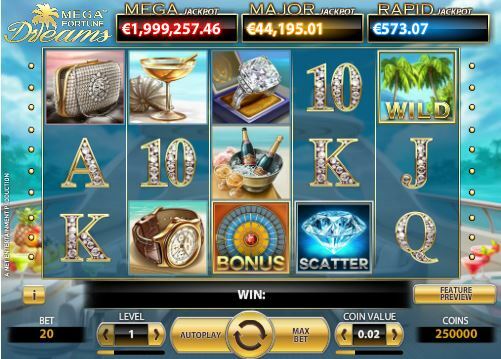 Net Entertainment made sure that it would be a game that you would love to play, even without the progressive jackpots which can make you rich. The Dreams part of the title fits it as well. Even the playing cards look great here, being made out of diamonds. Symbols: Tropical Island (5,000x, wild), Blue Diamond (scatter), Wheel of Fortune (bonus), Diamond Ring (2,000x), Watch (1,000x), Handbag (600x), Champagne (300x), Cocktail (200x), Ace (150x), King (100x), Queen (75x), Jack (50x) and 10 (40x). It’s an impressive game, no matter at what you’re looking. The design is one of the best I’ve seen with this theme, it has some great features (with 10x multipliers included) and the payouts are among the best of the industry. This Mega Fortune 2 slot is offered by all online casinos with NetEnt software, playable either in practice or in real money mode.